Caption slip reads: "Photographer: Wyman. Date: 1958-01-20. Reporter: Donoghue. Assignment: Sophia Loren arrives by air. 77-78: Actress Sophia Loren and producer husband, Carlo Conti, upon arrival at International Airport via SAS Polar flight. 61: Sophia Loren waves 'hello' to Los Angeles after arrival by SAS from Copenhagen via North Police. With her is producer husband, Carlo Ponti. 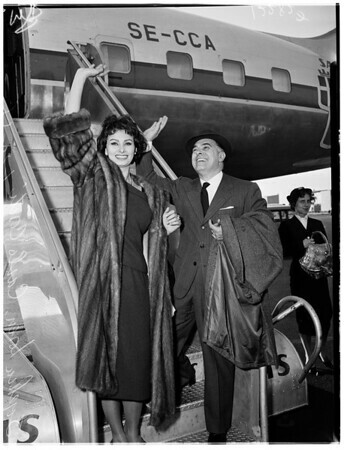 37-38: Sophia Loren, Italian film star, and producer husband, Carlo Ponti, are greeted upon arrival at International Airport after over-the-pole flight by Paramount director Martin Ritt, who will be in charge of the star's forthcoming production 'Black Orchids.' Ritt gave Sophia corsage of black orchids to get this point over".